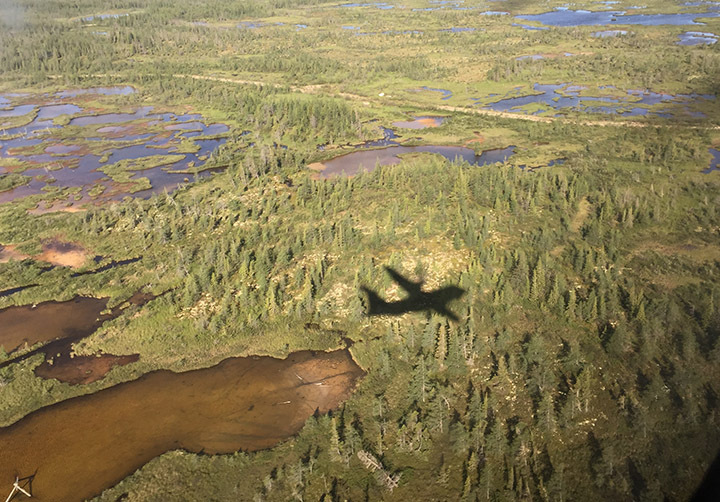 Flying north from Thompson, we leave the road system behind and head north for an hour toward Hudson Bay under skies full of promise and over miles of mosquito-plagued tundra. 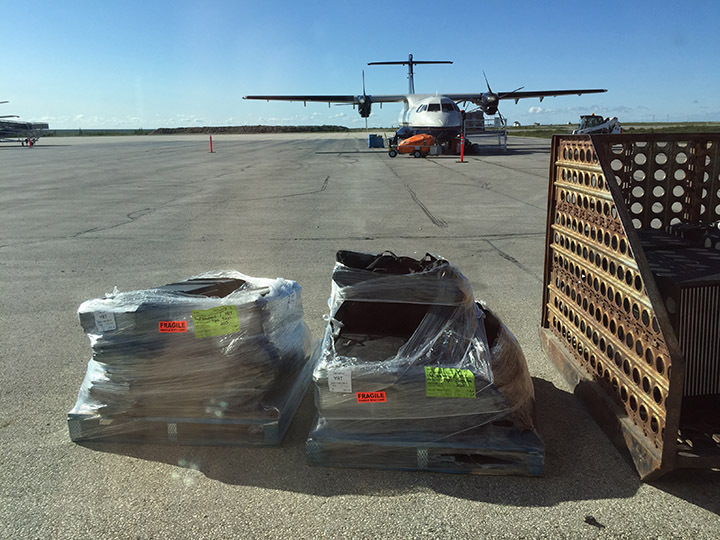 We land in Churchill to drop off 90% of our passengers, and pick up cargo and fuel. I study a massive polar bear carcass strung up in a display case, safely behind glass while it’s sightless glass eyes follow me around the room. Having left behind a journalism career, I no longer have a professional interest in staring at anyone else’s humiliation or despair, and I look away. Out the window, I’m a little surprised to see all my air cargo sitting sitting right outside, a little worse for the wear since I last saw it, but seemingly intact. A little bobcat front end loader scurries over, scoops the pallets up and pops them into the cargo hold. Sweet. If I’m going down, I’ll go like the pharaohs, entering the hereafter with my worldly possessions scattered around me. Only a handful of passengers reboard for the connection to Rankin Inlet. It’s just three stout Inuit women, the flight attendant and me. We take off into the cold breeze blowing off the bay. In a few minutes, we fly along a coastline that took me weeks of boat-slamming to cross. The same one I’ll have to cross again to get back home at summer’s end. 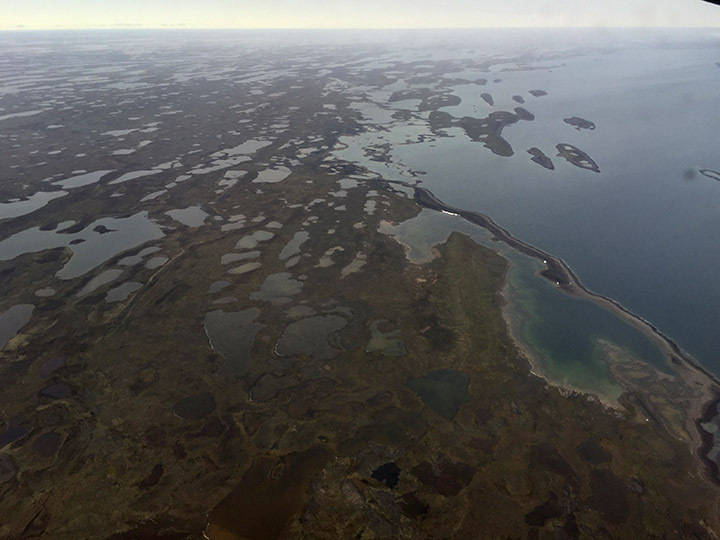 There are no landmarks, just flat barren coastline dotted with lots of reefs and rocks, a few tiny Inuit outposts and 400 miles of open sea to the east. By the time we circle over Rankin, blue skies have turned to glowering clouds and worked its way down the scale to creepy minor chords of low scud and cold rain. Not to go all Robert Falcon Scott on you, but “Great God, this is a terrible place.”But the terminal buzzes with activity and I even recognize a few faces. It’s a five dollar taxi to pop in unannounced on my friends at the Nanuq Lodge. It feels like coming home. I’m given to the keys to a room and one of John’s half dozen half-running Suburban trucks and quickly set to work. My boat spent the last ten months covered in layers of blue tarp, protection against the brutal winter weather and packs of roaming, ever-curious kids. A few of them found their way in all the same, breaking off chunk of antenna along with my depth sounder. I count myself lucky that it’s not worse. I start cutting away the rat’s nest of rope and cord I’d strung together to secure the tarps, peeling away layers until I reach boat. Neither the years nor my uneven seamanship have been kind to her. All the same, she looks good to me, like an old friend. Beat all to hell but ready for more. That’s what I tell myself, anyway. This entry was posted on Friday, July 24th, 2015 at 9:00 am. It is filed under On the Road and tagged with Arctic, C-Dory, Canada, Expeditions, Hudson Bay. You can follow any responses to this entry through the RSS 2.0 feed.